2.0 had all the possibilities to break Thugs of Hindostan's first day box office record of Rs 52 crore at the domestic market, but it will not just for one reason. After the debacle of Thugs of Hindostan, a lot of expectations are associated with 2.0 starring Rajinikanth and Akshay Kumar. 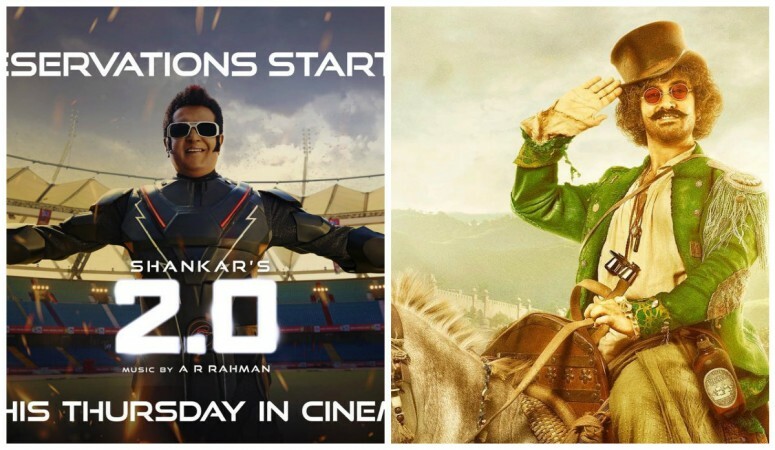 Although 2.0 is grandeur than the Aamir Khan starrer, there are many reasons to predict that it will not be able to break day 1 box office collection record of Thugs of Hindostan. 2.0 is much bigger than Thugs of Hindostan in terms of budget and screen count. While Aamir's period drama was made at a budget of Rs 300 crore, the sci-fi thriller involves Rs 500 crore as its cost of production. This is, infact, the highest for any Indian movie ever. Also, 2.0 has managed to grab much more screen count than what Thugs of Hindostan was allotted across India. While TOH was released on 5,000 screens (including Hindi, Tamil and Telugu), 2.0 is set to release on around 6,600 screens in India, according to Bollywood Hungama. Moreover, unlike Thugs of Hindostan, 2.0 has a star cast that is potent enough to pull audience both from North as well as South India. Rajinikanth's presence will attract massive audience from the South, and Akshay is extremely popular across the country. With all these favourable factors, 2.0 had all the possibilities to break Thugs of Hindostan's first day box office record of Rs 52 crore at the domestic market. However, there is just one setback for the mega-movie that will stop it from making the feat. While Thugs of Hindostan was released on a big festive season, 2.0 is going to hit the screens on a regular working day. Unlike most other films, 2.0 is going to be released on Thursday, which will restrict its collection to a great extent. Moreover, 2.0 is apparently not having a very positive response across the north belt as far as advance booking is considered. According to early box office predictions, the movie is expected to earn around Rs 25 crore on its opening day. Hence, Thugs of Hindostan is likely to remain the highest first-day grossing Indian movie ever.